I couldn't afford $300 for one of these and couldn't find any plans on the 'net so had to design my own. Space is at a premium so it had to completely fold, too. My husband and I engineered and assembled this one. 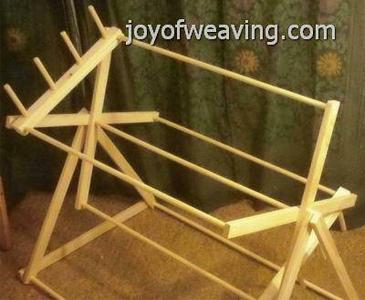 By removing the cross pegs and one end on each side of the leg supports, the entire thing folds flat and can be hung on a wall or stored under a bed. What's not to love about that?! The plans are sent to the email address included with the PayPal payment. If you have not whitelisted joyofweaving.com in your email filters, it will end up in your JUNK/SPAM folder. Check the JUNK/SPAM folder of the email address used to make your payment. Check your PayPal account to ensure the email address on file is current. I will email you the .pdf file of the plans after I receive payment (usually within 48 hours). -send a message via my contact form. You don't need a PayPal account to use this button. Thank you ever so much. Your purchase means a lot to me (more than you'll ever know). If it says alice_aod, it went to the right place. No worries! I'm often asked how many yards it holds. That's hard to answer. I haven't made a warp, yet, that will max it out. It all depends on the size of the yarn you are using, how many ends you make and how many times you spin it. If you need to make insanely long warps, you can always make it wider. Each rotation yields 2 yards. My friend Linda posted a video on how to use a horizontal warping mill with multi-threads using a paddle for super fast warping! I just purchased the plans via paypal and the paypal page says it went through! Can you please let me know if you got it ok? I got an error on your page once the payment was done! best! Payment was received. Plans were sent! :) Enjoy! Actually "how many yards" can at least be partially answered. You should know how much 1 turn holds. That is easily calculated and is constant. Hopefully it is 1 yard? Each rotation is 2 yards. I will update the de scrption. OMG! Just finished making this, and it's a BEAUTY! Only cost $50 in materials ... and $400 worth of tools we already had. 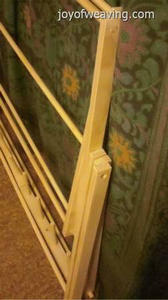 Used 3/4 inch dowels, made one peg removable to make it easier to take off the warp. Thank you Joyce and hubby! I'm so glad you like it! Thank you so much for your support! So glad you're enjoying it! Thank you for your support! I have a question. I built my mill today but it squeaks really bad. My question is should the middle dowel turn with the mill or should the warp part turn on the axle( middle dowel) ? The only thing that turns is the frames. 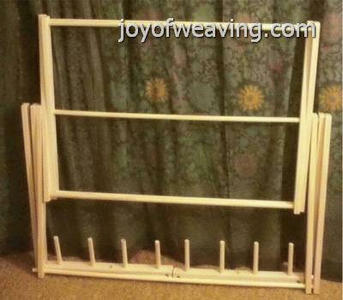 You might have to make the center holes in the frames a little bigger or put some soap in the holes to stop the squeaking. If it's very humid in your area, that will effect things so keep that in mind too.